Competing in a triathlon is not for the faint-hearted and, as it combines running, cycling and swimming, you’ll have different training regimes for each particular discipline, all of which will differ from person to person and to condense each of these into one short article would be impossible. For the purposes of this article however, it’s going to be broken down into training phases. From the basic training you’ll need to focus on initially to more intense preparation as you get closer to the race, to competition ‘season’ itself and, not forgetting recovery – which is as much a part of triathlon preparation as any training itself. Most of the major triathlon events of the UK season tend to occur between May and October of each year, although there are partial variations of the event over shorter distances or throughout the year. These events are held all over the country and the best way of finding out what events are happening near to where you live is to visit the British Triathlon Association’s website which features a calendar outlining all of the various events for the year ahead. Once you have identified a triathlon(s) in which you want to apply to compete, then you should start your basic training about 3 months ahead of the scheduled date. Here you’ll be simply concentrating on drill sessions for each of the disciplines and it won’t be that intensive at first but will be quite lengthy and often a bit repetitive. It’s also the time for any strength training if you need to do some and to get to grips with any new equipment you intend to use, the most obvious being a bike. During this period, you should monitor and keep an ongoing record of improvements in times and also keep records of your heart rate. Although you’re still building up to full competition, you should be looking to improve your speed and time completions in each of the disciplines and this is where some of the smaller events on the calendar in the early part of the year can come in useful. By competing in one or two of these partial events, you can gauge improvement by entering events that just focus on one specific discipline such as the sprint alone or an aquathlon which just contains the swimming and running elements or a duathlon which focuses on the running and cycling. This gives you an opportunity to focus more on the particular discipline(s) you feel you need to work most on in order to improve. After 3 months and close to the triathlon itself you should be at your peak both stamina wise, fitness wise and with your technique, the objective now is simply to build up more speed. It’s all about the intensity level where you’re getting your heart working to the top of its capacity and this is where you should really begin to see the improvements in your times. Keep a log book of your heart rate and times and see how they progress. 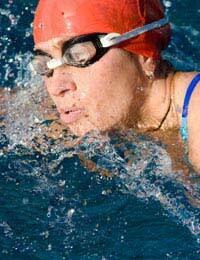 Most serious triathletes will compete in a number of races covering different distances and conditions within a season. You’ll no doubt have other commitments like work and family to also fit in so it’s important not to overdo it. Your fitness levels will be at their peak and simple basic training will be enough if you’re competing on a fairly regular basis just leading up to small periods of intensity training just before a race. Don’t get despondent if your improvement seems to stand still or dips slightly below peak performance from time to time. This is perfectly natural. If all athletes just kept on improving each time they competed, the 100m would be run faster than a bullet can travel. The reality is different however and the human body has its limitations so you should be prepared for the fact that you’ll probably hit your peak performance capabilities maybe twice over the course of a given season, no matter how well you’ve prepared. One of the major causes of injury and poor performance by any athlete is their obsession with training and it’s this that mostly causes the damage or limits performance. You can actually try too hard. Muscles need rest not only for recuperation but rest enables them to become stronger so make sure you build in rest days into your training schedule or you could actually be doing more harm than good which could ultimately result in muscle strains, tears and complete muscle ruptures so allowing a good 48 hours between training sessions and working a routine where you’re focusing on different muscle groups each time you train will be the best way to maintain a healthy training regime and is more likely to keep you injury free.